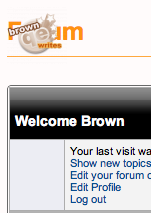 The Gravatar that is covering the title at the top is supposed to be sitting in the box underneith “Welcome Brown”. Any ideas on whats causing this or how to fix it? Well, I don’t see that happening anywhere on your blog. Does this only happen when you are logged into the forum? I’m not seeing it as a guest. If this only happens on the forum page, it is possible that it is a problem with the forum plugin. Perhaps it interferes with another plugin. I turned the avatar icon off because of the error. I did manage to get it to sit sort of in place when i messed around with some of the css – so i guess it must be a result of something I’ve written into the child. Thanks for looking though. position:absolute; is what keeping it at the top right, actually. Try to revert back so that I can see what’s the issue? Or you can always hide the avatar only on the forum page by using CSS display:none;.